A remotely operated vehicle (ROV) has been used for the first time to film coelacanths as part of research on the prehistoric fish in the Greater St Lucia Wetland Park. The latest coelacanth expedition, which ended on Sunday, filmed a record eight coelacanths during one dive. The success of trial tests for the vehicle has also opened up possibilities for new marine research in the Wetlands Park, and will make such research accessible to others, said Wetland Park CEO Andrew Zaloumis. The African Coelacanth Ecosystem Programme (ACEP), formed after the discovery of coelacanths in 2000 by a group of recreational divers at a depth of 104m in Jesser Canyon off Sodwana Bay, recently partnered the Durban-based Sub-tech Diving and Marine to test an ROV for the study of coelacanths in their canyon habitats. This has now proved entirely successful, more cost-effective and less invasive than using a mini-submersible. Zaloumis said that after shallow water system tests, the ROV, hired from Cape Town Marine Solutions, was used to penetrate a cave in Jesser Canyon where a small coelacanth was filmed on the first day. Eight more coelacanths were found on May 6 at depths between 104 and 112m. 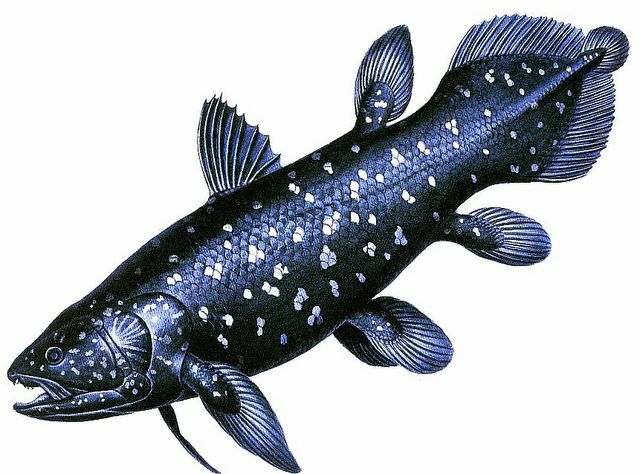 "Some of the coelacanths have been previously sighted but preliminary results suggest that some are new animals that will increase the known numbers of these prehistoric fish in the Wetlands Park," Dr Harris said. Read the full story HERE. Photo from HERE.